Classwork: Read the following myths and answer the questions that follow using Complete Sentences. Here's an idea: Open this page in another window, and work Side-By-Side, instead of scrolling up and down. Loki was a Giant who become the blood-brother of Odin. Son of the Giant Farbauti (Cruel Smiter) and Giantess Laufrey. Pleasing and handsome, evil in character, capricious in behavior, cunning, he is known as the Trickster God, called "Father of Lies", Shape-changer, Sky-Traveler. 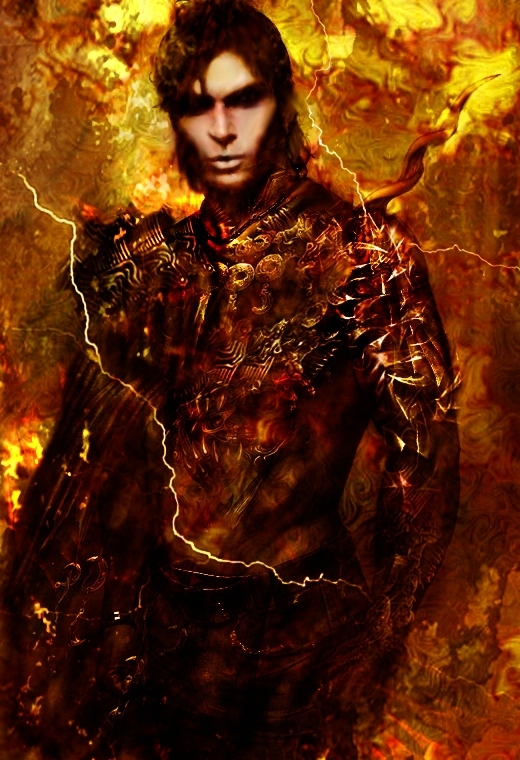 Originally, he was the God of Fire. He has fiery red hair and is extremely funny and witty. He would do anything to make people laugh. Eventually, his pranks devolved into practical jokes with a streak of viciousness. Loki was married to Sigyn and with her he had two sons, Vale and Narfe. Loki also had relations with another woman, Angerboda. With her he had three children, two sons and a daughter; Fenrir, the Midgardserpent, and Hel. Fenrir was not a normal child, for he was born in the shape of a wolf. The asir kept him at Asgaard and fed him well and so the wolf grew. At first it did not seem he would be a danger, but as he grew it became clear that he would be much bigger than ordinary wolves and as he grew in size he also grew in wildness. In the end only Tyr dared feed him and the gods realized that the wolf would be a very real threat to them, so they thought long and hard about what to do, for they knew that they could not kill the wolf. In the end they that the only way to go about this was to chain the wolf. So all the gods came together and made a rope to tie the wolf with. They made a huge and very strong rope and brought it to Fenrir. Then they said to him that if he could break this bond then he would certainly be known far abroad for his great strength. Fenrir looked upon the rope and then agreed to be bound with it. The gods put it around his neck, and thought that now they had captured Fenrir, but the wolf merely shrugged and the bonds broke as if they were merely sewing threads. Now the gods were even more scared of the wolf than they had been before, for he was even stronger than they had thought, so it was more important than ever to get him chained. So the gods made an even stronger chain and once more they went to the wolf, saying that if he could break this chain he would surely win great renown for his great strength. Fenrir had felt his strength grow since he broke the first chain and the thought of renown tempted him greatly, so he let the gods put the chain around his neck. He shrugged, but the chain stayed intact, and now the gods were sure that he was chained, but then Fenrir pulled at the chain and it broke just like the first one. Now the gods realized that they would not be able to tie the wolf unless they used a magic chain. So they went to the dwarves and they made the gods a chain that was made of all the strongest materials in the wold that no one can break; the sound of a cat walking, the beard of a woman, the roots of the mountains, the breath of a fish, and the saliva of a bird. These things were twined around the tendons of a bear. The new chain was so light and soft that it looked more like the soft bonds women would use to bind their hair with, but this new chain was unbreakable and no matter how much the gods pulled at they could not break it. 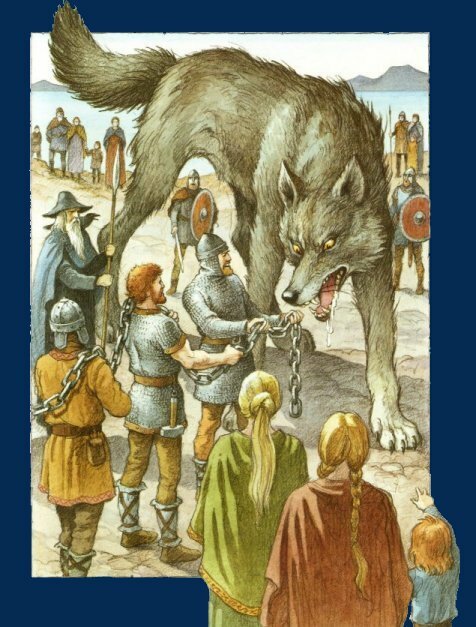 Assured that this chain could not be broken by Fenrir they went to him once more, showing him the chain, saying that if he could break this chain he would be known as the strongest in the entire world and everyone would praise his name. Fenrir looked at the thin thread and said to the gods that he would only allow them to chain him with that on one condition; that one of them put his hand in his mouth, for he was sly and he had guessed that this was no ordinary chain and that there had to be magic involved. The gods now looked around amongst each other, for none of them wanted to be the one to put his hand in Fenrir’s mouth. In the end Tyr stepped forward and put his hand in the wolf’s mouth as required and the other gods chained Fenrir. The wolf struggled against the chains, but when he realized he could not break them he bit off Tyr’s hand and all the gods laughed, for now the wolf was chained and would be no danger to them, all except Tyr for he had lost his hand. Fenrir will never come loose before Ragnerok, the twilight of the Gods, where the last great battle will be. There he will come free and kill Odin. Odin will be avenged by his son Vidar, who will kill the wolf. The Midgardserpent was no ordinary child either, for it was born in the shape of a worm. At first the asir let it stay in Asgaard, but soon it became so big that there was no room for it, so it was decided that it be thrown in the sea, for surely there would be room for it, but the worm kept growing and in the end it was so great that it could reach all around the world to bite itself in it’s tail. One day Thor went to visit the giant Hymer in the shape of a young man and he stayed there for the evening meal. The next day Hymer was going to go fishing, and Thor asked if he could come with him. Hymer looked at him and then said to him that he didn’t think he was fit to go on a trip like that, for he went out far when he went fishing and he was afraid the young man would want to go ashore before they reached the place he wanted to go fishing, but Thro merely shook his head and answered that he would not be the first to ask to go back and so Hymer allowed him to come. When Thor asked for bait Hymer told him that that he would have to see to for himself and so Thor went to a field where many oxen were grazing and when the biggest one came running towards him Thor grabbed it by the horns and wrung it’s head, pulling it off as he did. Then he went to the boat while Hymer looked on in amazement. When they reached the place Hymer usually fished from he wanted to stop but Thor did not think they were out far enough yet and so they went further out, but not long after Hymer wanted to stop again, but Thor said that they were not far enough out yet, but this time Hymer protested, saying that if they went out further they might very easily meet the Midgardserpent, but Thor did not care and continued out. When they were finally far enough out Thor threw out the head of the ox and soon he got a bit. It was the Midgardserpent. 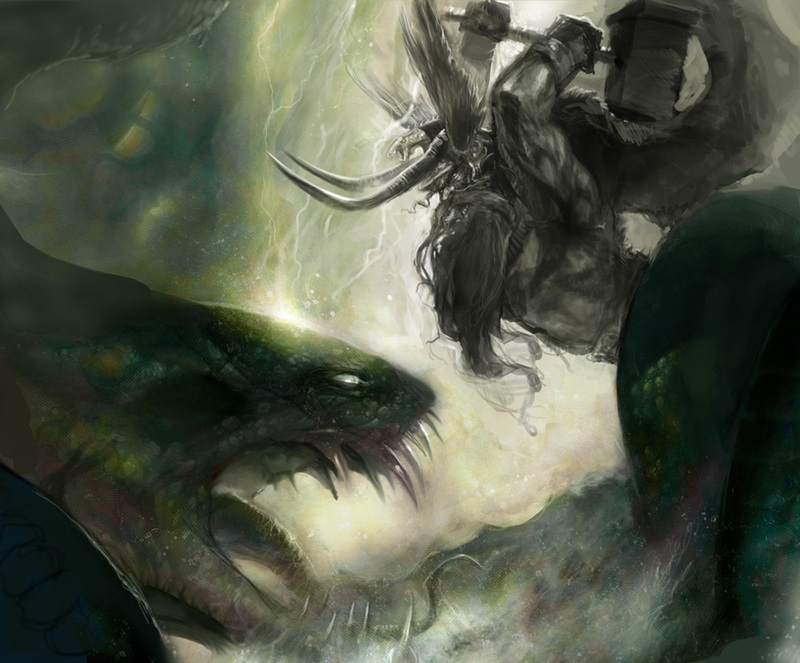 Thor pulled hard to get it in, but the worm resisted and fought him hard, but Thor was not going to let the worm win and have to go back without having killed it. He pressed so hard against the bottom of the boat that his feet went through, but still he pulled on the line refusing to give up. 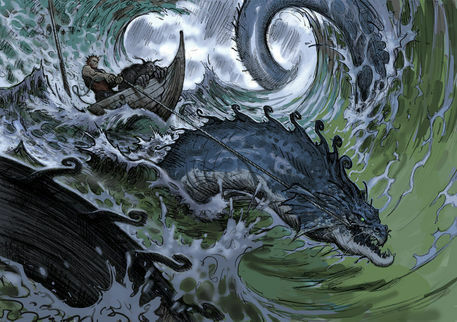 Meantime Hymer was looking on, and when the head of the gigantic worm appeared, spitting poison and venom at them, he started fearing and pulled out his knife, cutting the line just as Thor was about to pull the beast in. Thor was furious that he had lost his catch and threw his hammer at the worm, but did not kill it. Since he had already used his bait there was nothing more to do and they had to return to land without the Midgardserpent. At Ragnerok Thor will meet the Midgardserpent again and kill it. Then he shall walk three steps before falling to the ground, dying form the wounds he got while fighting the snake. 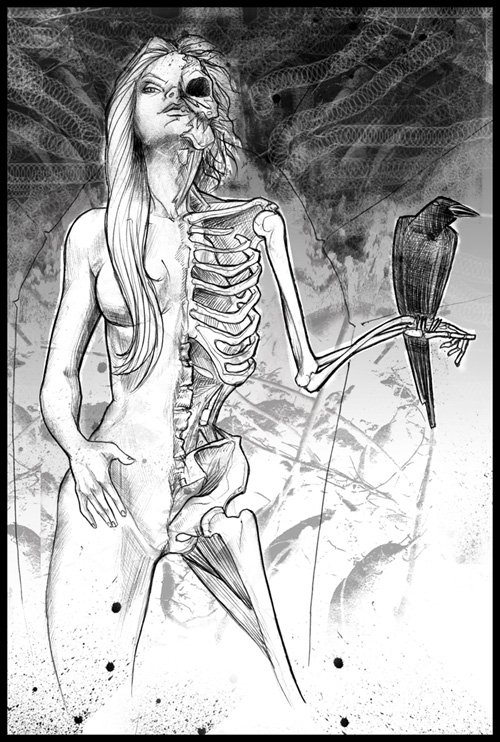 Hel is the third of Loki and Angerboda’s children and she is the ruler of the realm of the dead and is often said to be the goddess of death, but this is only partly true, for she has to share the authority over the dead with other people as well, most noticeably Odin as some of you who did the extra credit for last month might have noticed. 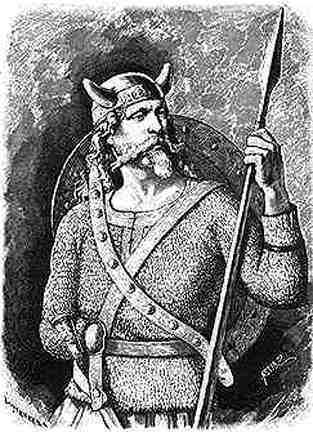 Odin is the king of the gods and all human warriors dying in battle come to him so that on the last day they will be able to participate in Ragnerok, fighting for the gods against the giants. Odin is therefore a god of death, among other things. Hel and Odin are the two that are most often referred to when a god of death has to be found, but the goddess of love also has a part in this, for Odin actually only get half of the men that fall in battle, Freya get the other half. Girls and women who die as virgins come to Gefion who is their protector among other things. All other people who do not die in battle come to Hel. That means mostly people who die from either illness or old age. Hel’s table is called Hunger and her knife is called starvation and most of her other belongings have names of the same kind. Her realm is dark, cold and wet and all eho live there suffer until at Ragnerok they will be freed to participate in the fight, but they will fight on the side of the giants, for their mistress Hel is more giant than god. For those of you who know the Greek Mythology it may be well to note that Hel and Hades have much in common and so do their realms. This may ease the understanding of the two places and persons.